The trip of a lifetime...by horseback! How many miles do you travel in a day? We traveled approximately 15 to 25 miles a day. We rested at least 2 days per week. Sometimes we would stay in an area for a few weeks before moving on. The horses mostly grazed on grass. When there was no grass, we fed them hay. Do you travel on roads? We mainly traveled along the backroads of America. Horses are not allowed on major interstate highways, which is a good thing because Dawn is petrified of big trucks and tractor-trailers. Half the time we camped out, the other half of the time we stayed with people we met along the way. 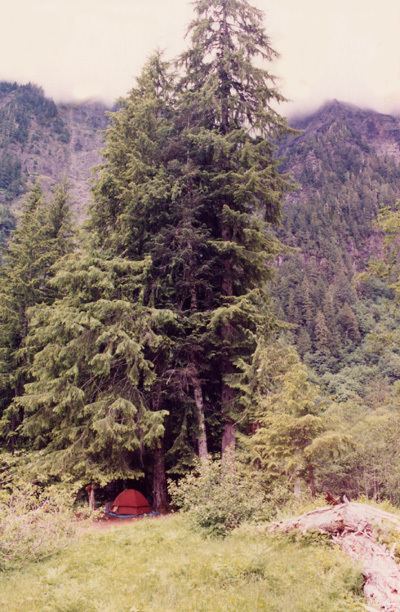 A good campsite is one that has plenty of grass and water for the horses, and one that is safe: open fields, meadows, parks, schools (summer), churches, etc. We called our parents at least once a month when we ware traveling. 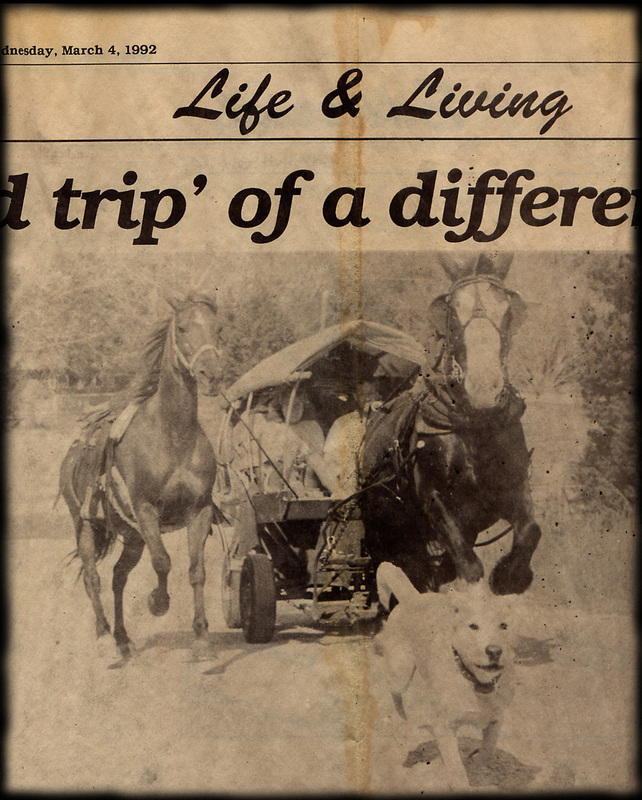 Once a year we found places to keep the horses for a week and flew home to visit our families. Yes, we missed them! We weren't independently wealthy (I wish!). It was a tradeoff, either stay in the rat-race and have a house and a car and all that goes with them, including the kids, OR...give it all up for the freedom of adventure! We left from New Hampshire with $2,000, but that quickly disappeared early on when we were still figuring out what we did and did not need. From then on we got work along the way and also received donations. Will you ever write a book? The saddles we used on our journey were just conventional western saddles. However, we did have to modify them slightly. Most western saddles have saddle strings that are just stapled on. They are useless for tying things to the saddle. We got 7 foot long latigo strings and attached them to our saddles by drilling holes all the way through the saddle tree and then pulling the strings through. Our horses had chest plates to hold the saddles from sliding back. We used string girths with stainless steel rings. At first we tried the fuzzy type, but they were slippery and caused the horses to sweat under them. Our horses did not need bridles or bits. We only used halters with rope reins. The advantages of this were: 1) it was more comfortable for the horse, they could forage along the way, 2) it was more convenient to tie the horses when stopping briefly, 3) less equipment to carry and maintain. 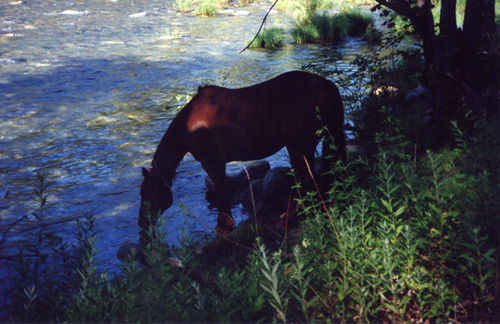 When camping at night, we tied the horses using 75' ropes which gave them plenty of room to move around and graze. Each rope had a metal snap on either end. I tied a loop near one end so that we could fasten it around the horses' necks like a collar. That way their halters could be removed for the night. Dawn always wore a collar around her neck made of thin rope. Sometimes I would clip a bell onto it so I could hear her movements, especially if she was turned loose for the night. 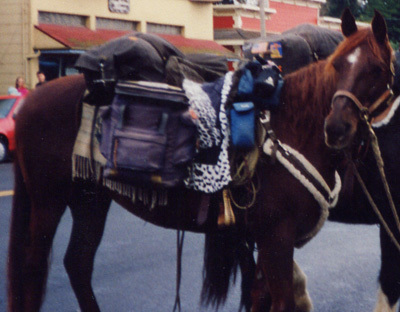 Our journey was unique in the fact that we did not have a packhorse. 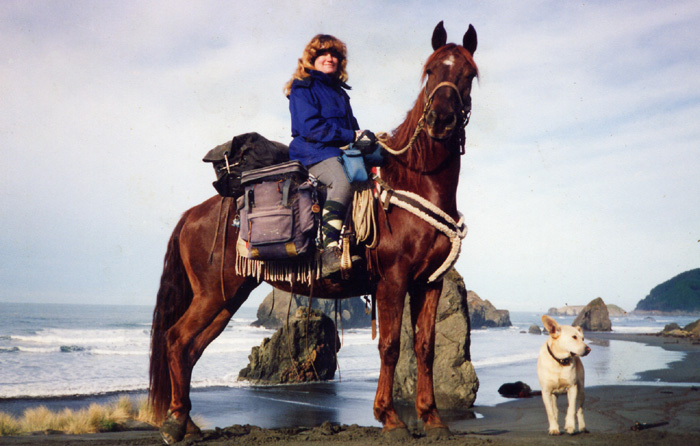 Each of us had the equipment and supplies we needed individually on our own horse. We started out with regular canvas saddlebags. Those lasted about a week and a half! Then we went to leather. They were heavier and lasted just about as long. At last we tried army/navy backpacks. So far, nothing can beat the quality and durability of these packs, not to mention the low price and all the cool pockets! Because they are meant to be used as backpacks, some modifications have to be made. The straps should be cut off. A special harness made out of nylon seatbelt material is then sewn onto each backpack using a leather-sewing awl. Seatbelt material wont wear out, and it is extremely strong. Next the saddle must be outfitted to accept the modified backpacks. All that is needed is more seatbelt strapping and some snap hooks. The following diagram shows how to make this simple saddle harness. 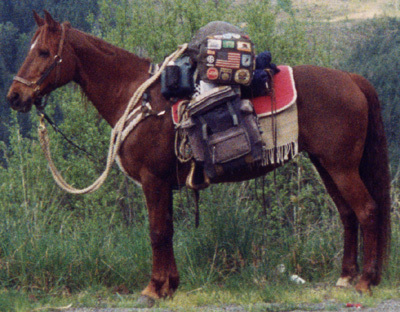 The unique feature of this packing method, as opposed to conventional saddle bags, is that most of the weight of the saddlebags is shifted forward under the rider, and off the horses lower back and kidneys. Another great feature is that it takes less than 30 seconds to put the packs on after the horse is saddled. The packs have two D rings on the back which hang on two small hooks that are attached to the saddle harness. So the daily routine of packing the horse is only a matter of picking up the packs and slipping the D rings into the hooks! We kept our sleeping bags behind the saddle in an army/navy canvas duffle bag. This was attached using the saddle strings. I sewed buckles into the strings which made it easy to attach the duffle bag nice and tight so it didnt wobble. 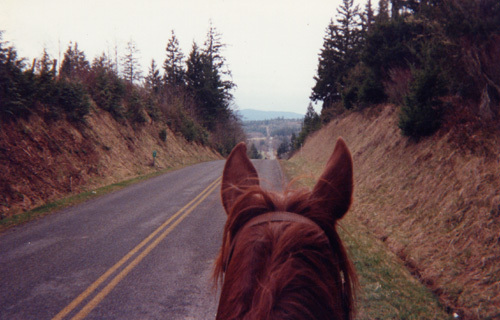 During our journey, I would walk several miles per day with my horse. When I was walking, I would shift all my packs (the two army/navy backpacks and the duffle bag) forward onto the saddle where I would normally ride. Dawn with packs in the 'riding' position. Dawn with packs moved forward in 'walking' position. When packing it is important to have the saddlebags well balanced. Just a pound or two off on either side can cause everything to shift to one side and rest unevenly on the horse. Each horse had three blankets. The first was a standard 27" x 56" thin blanket. This blanket was folded in half (doubled) and put on the horse first. The great thing about using this type of blanket against the horse is that when it gets dirty, it can be flipped over so that a new clean surface can be put against the horse. Then when this side gets dirty, there are two more clean sides before the blanket has to be washed. It is important to keep the blankets clean as well as the horse in order to avoid saddle sores. The second blanket was like the first, only narrower. This blanket draped over the horses' backs about halfway down the first saddle blanket. It served to protect the horses from the saddle bags. The third blanket was a thick, square western saddle blanket. Ours had inserts made out of space-age material that is found in the the seats inside of the space shuttle. These inserts could be taken out and the whole blanket could be washed. The material is wonderful because it evenly distributes the weight on the horses' backs preventing any pressure points. I did most of the farrier work myself, except when special draft horse shoes were made for Louise. I developed a special way to shoe the horses so that the shoes did not become loose as often and cause pieces of hoof wall to rip out. It is critical for a horse to have healthy hooves, especially when traveling great distances. The method of shoeing I used is very similar to the conventional method, however there are a couple of little tricks that will make shoes last longer and stay tight longer over any type of terrain, especially pavement. I have never liked using horseshoes. In fact, when I first started my horseback journey, my horse was barefoot! I had no idea how quickly a horses hooves could wear down when traveling on pavement (roughly 75% of the time). In less than 3 weeks, I was looking for a farrier to shoe my horse. Eventually I bought my own tools and packed them with me. Horseshoes are, at best, a necessary evil. The most preferable shoe I have found for long distance horseback travel is a lightweight, flat iron shoe with no heel or toe caulks. A shoe like this will wear paper thin and crack at the toe in only two weeks of pavement travel. Borium is a must. This same shoe, properly coated with borium, will last one year of pavement travel! Welding borium onto a shoe is an art as well as a science and must be done properly to be effective. Anyone who knows how to weld can do the job. Borium consists of tungsten carbide chunks in a brass matrix. The shoe is preheated first. This can be done with a hot torch flame, a forge, or even a good campfire! When the shoe is hot, borium is applied using a torch with a low flame. If the flame is too high, the borium will burn and pop! This stuff melts at a low temperature. The borium should be applied in a thin single layer (not more than 1/8 thick) for the main purpose of protecting the shoe from wear. There is no need to build the layer of borium up thick. Borium is also very effective for riding on ice and other slick surfaces such as parking lots coated with blacktop sealer! Because borium affords the shoe some traction, it is advisable that a horse not used to borium shoes be ridden on soft surfaces before riding on hard, unforgiving surfaces so as not to cause leg injuries. *Note: there is an alternative to shoeing with iron shoes and nails - nylon shoes which are applied with epoxy. I have not tried this, but I intend to do so for my next horseback adventure. Meader Supply has these shoes. The trick to avoiding loose shoes is finishing the nails properly. Most farriers will drive a nail into the hoof wall and then wring off the nail by using the hammer claws to twist off the sharp end of the nail close to the hoof wall. Dont do this. Instead, bend the nail over against the hoof wall and cut it off with nail cutters. Leave 1/8 of the nail projecting from the hoof wall. When all the nails are done in this fashion, they are then seated using a clinching block or any other piece of flat metal. Carefully file away any burrs under the nail stubs, do not create a groove in the hoof wall or file away any of the nail, as this will cause weakening. The nail stubs are then softly hammered flat against the hoof wall, and the job is done (see diagrams below). Turning the clinches in this fashion (as opposed to cutting the nail stubs short and then using alligator clinchers) will not cause tearing in the hoof wall, and they will last much longer. There is no need to smooth the clinches with a file because this will occur naturally in a couple days. A shoe nailed in this manner will stay tight for a very long time. I had shoes stay tight on my horse for 6 months straight while traveling. After nailing, bend point over. Gently, tap down nail stub. For more information about how to shoe horses, refer to the book, The Principles of Horseshoeing II by Doug Butler. The next trip I plan to make is exclusively in the state of Idaho. 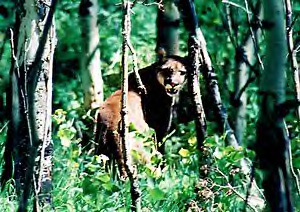 The main purpose of this trip is to see cougars in the wild. Idaho is one of the few states in the U.S. that is home to a large number of these beautiful, elusive cats. There are other reasons for the trip also: I need to be alone in the quiet wilderness once again, and what better way to train my green broke young Saddlebred stallion to ride and pack? I plan to take both him and my mare, a veteran of the road, Dawn. I promised Dawn that I would never take her on another long journey again - I formally retired her when her cross country trip was over - so this will be a fairly short trip of at least two weeks and a couple hundred miles. The next long trip I am planning to take will be with Kilroy and perhaps another young horse who I have yet to encounter. 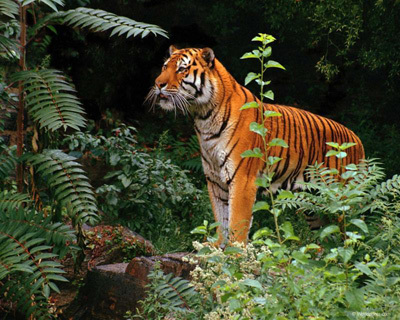 This trip will be for the purpose of seeing a tiger in the wild. Therefore, we will travel through Siberia! I will ride to Alaska and try to ferry over to the Kamchatka peninsula and spend the summer tracking tigers. From there I may travel through China to see yaks in their native lands, and then perhaps travel into India and see more tigers. Excellent resource for anyone planning a long horseback journey!